As we are all aware, the summer of 2018 has brought more extremely dry weather conditions to southern Alberta. Due to many consecutive daily high temperatures exceeding 30C, As a result, one of the most frequent questions we hear from our friends, supporters, and visitors, is "how are the birds coping with the heat?" Thanks to our caring staff and volunteers, combined with carefully designed enclosures and a well-planned site, our birds are doing just fine - possibly even better than many of their counterparts in the wild. Our thoughtfully designed enclosures provide significant relief from the direct sun since many are north-facing. 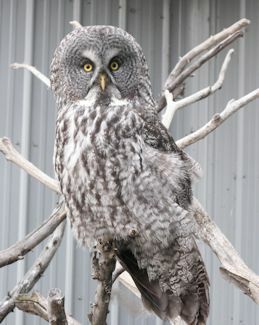 This feature provides critical heat relief for most of our display birds, particularly the owls which are less tolerant of intense heat. For both the birds and visitors, relief is also provided by shade produced by numerous mature trees on site. Thanks to our vigilant staff and volunteers, a final source of relief for many of the birds are the regular "spray-downs" that are offered daily with cool, refreshing water from the hose. We often remind our visitors, that the birds at our Centre receive the very best care compared to a challenging and dangerous life in the wild. During their time with us, the birds receive the very best food, daily exercise and at the end of every day are showered by servants. In other words, we would probably live a much longer life if we had the luxury and security of living at the Fairmont Banff Springs Hotel. 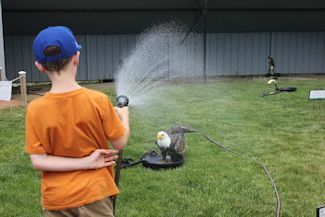 During these periodic "shower times", visitors also have the opportunity to help hose down the Bald Eagles and ask questions about how we strive to enrich the lives of the birds and release them back to the wild. The end of every "shower time" usually concludes with a happy cackle from one of the Bald Eagles, showing their pleasure and appreciation.